Sports Waist Pack / Waist Bag with Earphone Hole for Travel / Workouts [MnM005933] : Onchee.com - the accessory shop for all your handheld Electronics! This one is not only for hiding your passport, money and cards when you are travelling. It is also for smartphone, you can also put car remote keys, coins and more on your side pouches, 1 of the side pouches got a cover to keep your belongging safe. - Made of high density nylon fabric, robust, classic and fashion. - Freely adjustable strap buckle, you can adjust it according to your waist and comfort requirements. - You can put money, cards, keys, coins, cell phone, earphone etc in this running pouch. 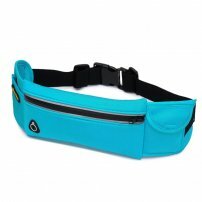 - Convenient: Waist pack allows people to have full use of their hands, more convenient than any purses. - This canot accomodate an iPhone XS Max, but it is not recommended for keeping such a big phone as it will be not easy to take out not put in. - Product Dimensions: 31.0cm * 4.0cm (thickness when nothing side) * 10.0cm approx. - Pockets: 1 in the middle, 2 pouches in the 2 sides, 1 of them with cover, 1 or them is not. - If you use this one to keep a phone, the max side recommended is an iPhone XS (143.6 x 70.9 x 7.7 mm (5.65 x 2.79 x 0.30 in), you can put an iPhone XS max safely into the pocket, but it is not recommended.